Each electrical transmitter for pressure or other measurands needs an electrical connection. For general industrial applications, the M12 circular connector has established itself as the standard. 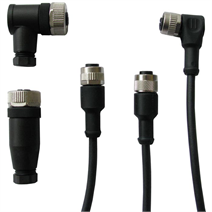 WIKA offers a wide range of M12 cable assemblies and connectors for use in industry. Are you interested in a specific design? Here you can find further details.